So today was the big event. 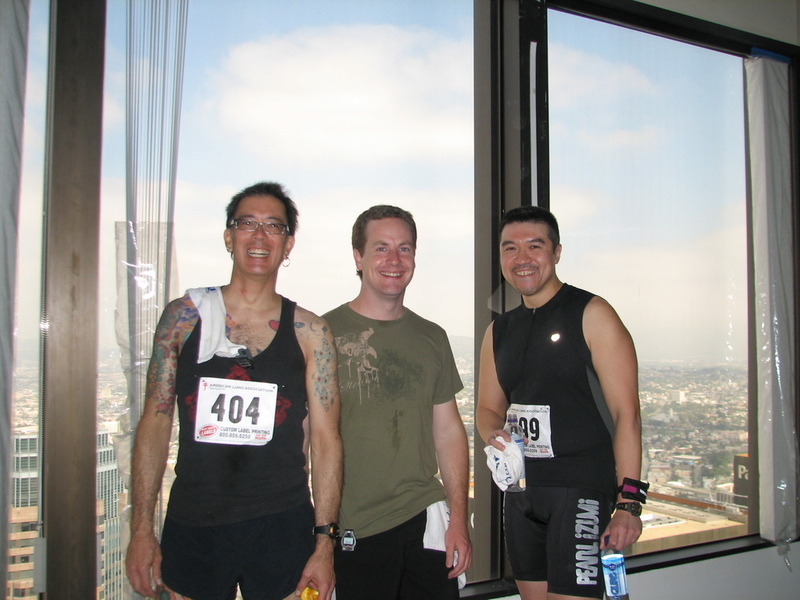 The 63-story stair climb up the Aon tower in downtown Los Angeles. After all the practice runs and all the mental preparation, it was showtime. Since I was scheduled to start in the first group, I had to be there by 8:00, so I got up early and took the Metro Gold Line downtown. I got out of the Red Line subway station about 10 minutes before 8:00. Kathleen had ridden the subway in from the Valley, and she was already there. It’s always good to have a personal cheering section at these kinds of things. 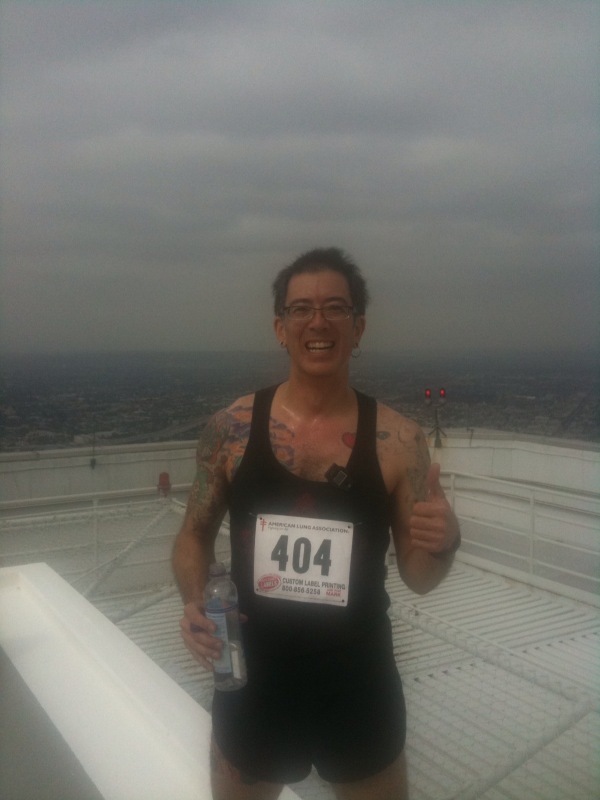 I got registered and got my number: 404-Not Found. Well, I got a chuckle from it anyway. 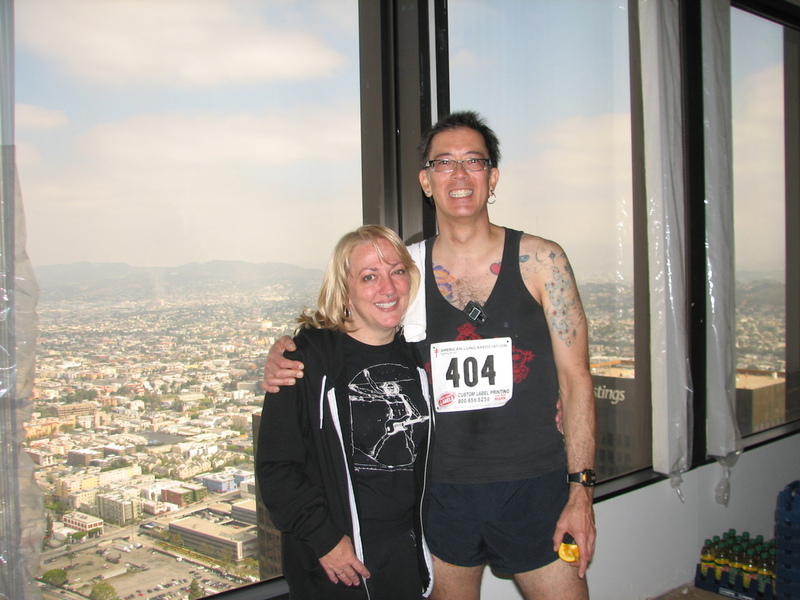 We saw Susan from the Stratosphere stair climb and U.S. Bank stair climbs there. There were several people there who we recognized from Las Vegas. It’s apparently a fairly tight-knit group that does this weird little sport. When 9:00 came they had us line up to start. I went pretty far back in the line. I knew that the front guys were going to go very fast, and I didn’t want anyone passing me. I haven’t been passed on the stairs yet at one of these things, and I didn’t want to start today. When it was my turn to go, I ran in the door and started climbing. I was quite a bit more serious about it this time, compared to last year. I didn’t carry my camera along to get a pain-picture on the way up. All I had was my stopwatch and metronome. And in the heat of battle I forgot to start the stopwatch at the start. D’oh! But my end-of-the-line strategy worked, and I passed about six or eight other guys on the way up. Kathleen had taken the camera and gone up to the 60th floor. They had the door open there to watch us go by. She said I looked like I was in some pain at that point, but you can’t tell from the picture because of the blur. And when I saw sunlight on the last landing, I managed to find a wee bit more for a final sprint up the last flight. When I got to the top, two guys took my arms and sat me down in a chair. I guess I must have looked like hell at that point, but I don’t know. At least they didn’t feel the need to give me oxygen like some people. I stayed on the roof for a little while to look at the view. While I was there, Randy from Las Vegas took my souvenir photo with his iPhone. Then we went down the stairs to the 60th floor, where there was a little party going on. I had some oranges and water, and my breathing returned to normal. 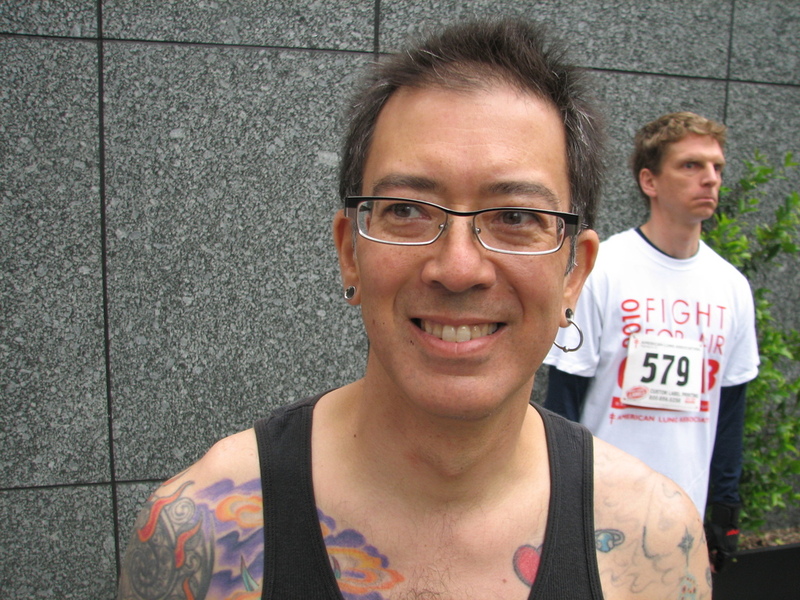 I was talking with a guy from Sacramento who had seen my web site and bike riding stories. 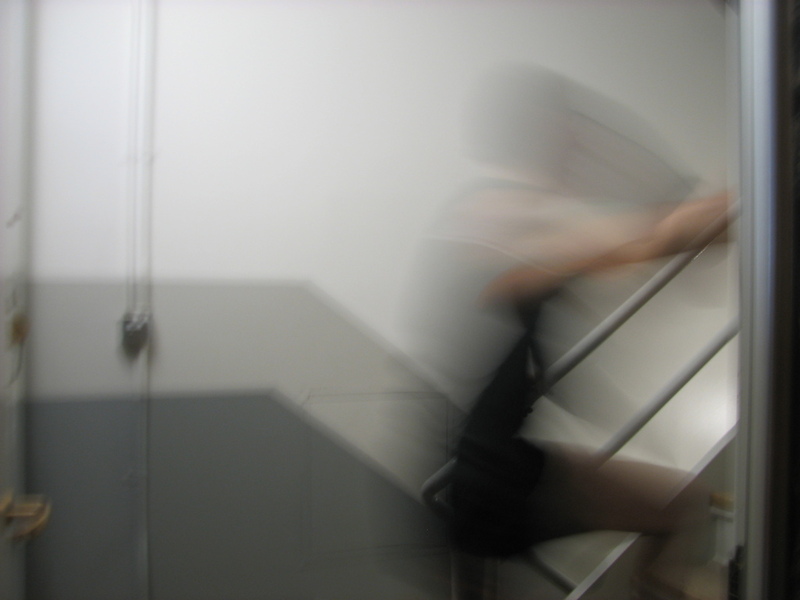 So we traded some bike stories and compared our experiences climbing the stairs. Then Erik showed up. He’d gotten there a little late so he didn’t get to start with our group. 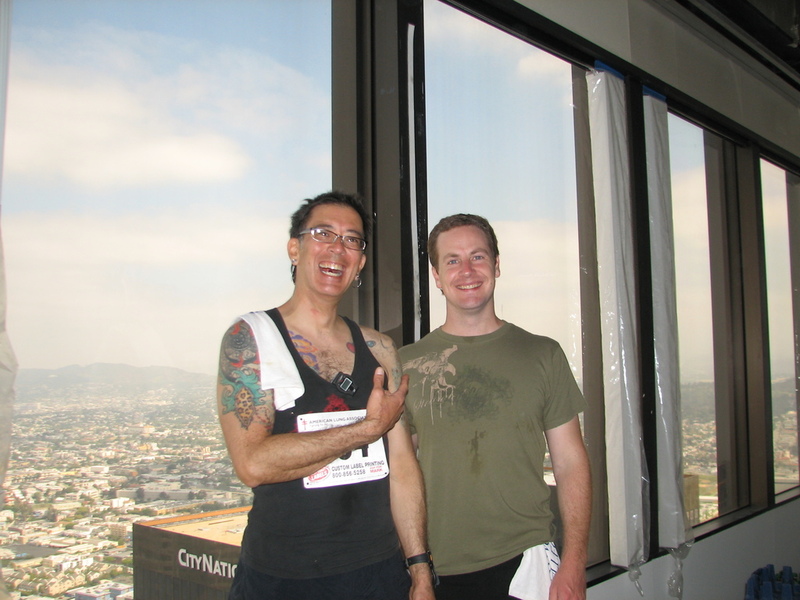 We all hung around on the 60th floor for a while before taking the elevator down. At the bottom, they’d already started posting results, and I was very pleased at my time of 11:42. My goal had been to be under 12 minutes, so this was quite good. And in fact, doing the math shows that I was going as fast as my last practice run. The practice runs were only 56 stories, so the fact that I was able to maintain that pace for the extra flights was a Good Thing. Erik turned in a time of 11:45, which means that all our practice runs to learn the pace worked. And the fact that I beat him by 3 seconds was a nice bonus. And in the end, I was 3rd in my age group, and 24th overall. I was 24th last year, but there were a lot more people doing it this time, so overall, I’m pleased. A little bit of math gives my power output to be 273 watts, or 0.37 horsepower. Kathleen and I hung around and schmoozed some at the little street fair they had at the bottom. We got some bagels, and I got a little massage. Then we headed back to the subway to go home. It was a most excellent little adventure. 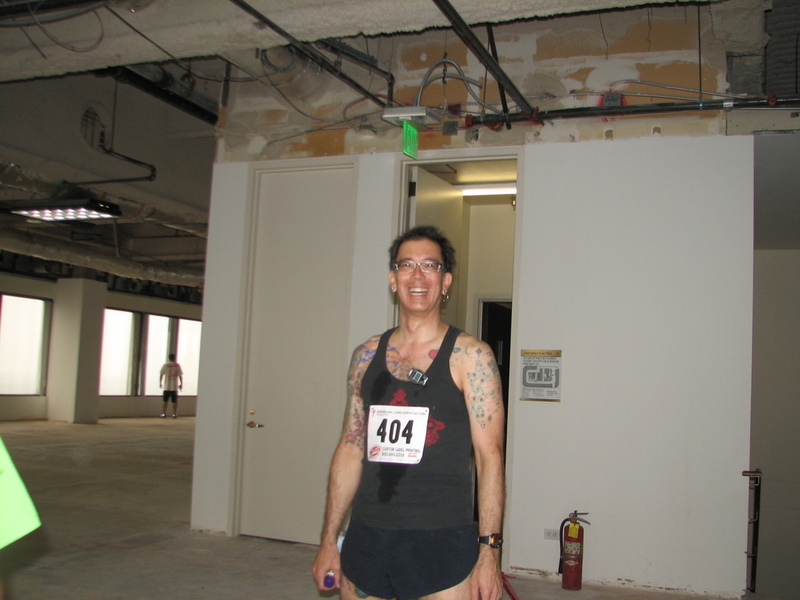 Now we’re looking ahead to the YMCA stair climb up the U.S. Bank tower in September. Onward and upward. Update 4/25/2010: They have the final results posted here. 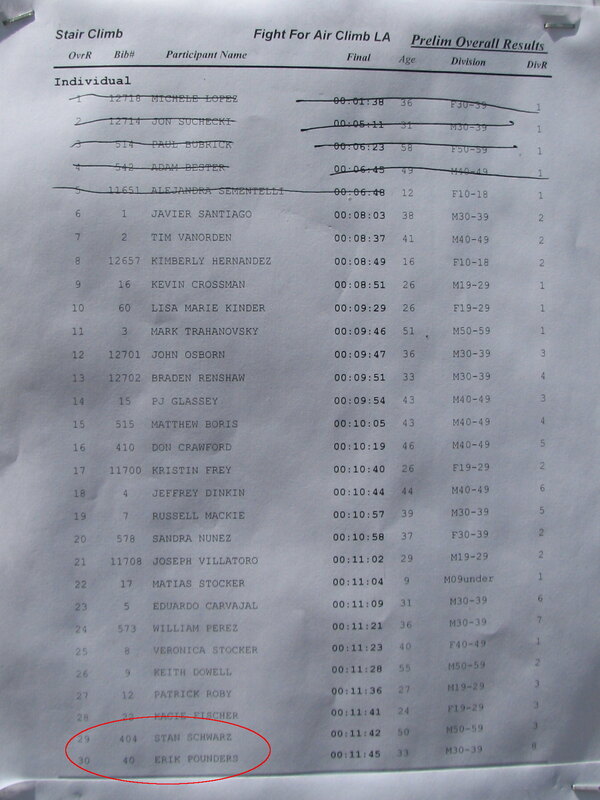 I was 22nd overall out of 493 runners, and 3rd out of 20 in the men’s 50-59 class. It was a good outing.